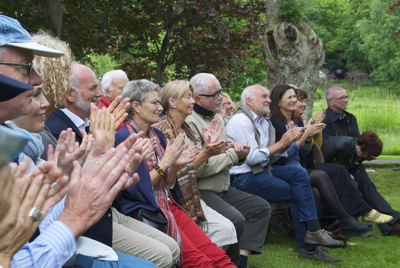 For more than 20 years, the large Vestfoldfestspillene music festival has been a much-loved tradition for residents of Vestfold County and their many summer visitors. But as this year’s festival winds down, it’s not expected to return in its present shape, after local politicians decided to shut down its holding company. The festival started back in 1991, aiming to promote music and culture all over Vestfold by staging concerts in each of its 14 municipalities. The program is a mix of music styles, performed by some of Norway’s finest artists in various places, from concert halls and churches to parks and other outdoor venues. On Thursday, for example, the violin-playing sisters Eldbjørg and Ragnhild Hemsing filled the gardens of Engø gård, an elegantly restored farm on the island of Tjøme south of Tønsberg, playing a repertoire of classic and folk music under the leaden sky. There was rumble in the distance, but not only of seasonal thunder. Hours after this year’s festival got underway with Brahm’s Requiem performed in Tønsberg’s cathedral, the politicians in the county parliament (Fylkestinget) ended years of quarreling over the festival by voting to shut down Vestfoldfestspillene AS, the company that organizes the festival. Jointly owned by the county and the 14 Vestfold municipalities, the holding company had been a source of discontent for several years. Most of the argument has been over the location of concerts, with smaller places complaining that the cities and Tønsberg in particular, get most of the action. Other Vestfold towns like Larvik and Sandefjord have threatened to withdraw, not wanting to pay for activities elsewhere. 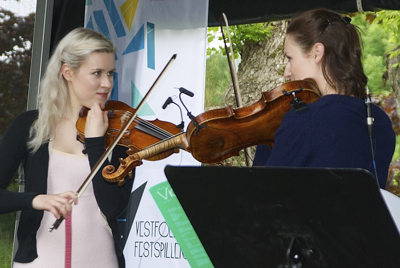 Last November, a political decision to have the biggest cities take turns organizing the festival caused the Vestfoldfestspillene board to resign. In May, the company decided to concentrate the festival around just one city, Tønsberg. And on June 20, the Fylkesting shut the festival company down. An unusual majority alliance of the right-wing Progress Party, the farmers’ Center Party, the Labour Party and the Socialist Left (SV) secured the shutdown decision, which took other parties by surprise. Vestfold county could have seen the last of this way to do things. The politicians made no clear decision on the festival’s future, saying only that state funding for the festival could probably be extended to similar cultural activities already in place. But Norway’s arts council (Kulturrådet), the government agency handing out that subsidy, is not so sure. Stein Kinserdal, Vestfoldfestspillenes board chairman, called the decision “sad and un-musical.” With no decision on the festival’s future, he is neither in a position to book attractions for next year’s festival nor try to establish a new system of county-wide cooperation which could rescue the festival. One local politician, Kåre Pettersen of the Liberal Party (Venstre) was particularly upset, comparing the timing of the shutdown with a store holding a bankruptcy sale on opening day.